Perhaps many of our readers will be interested to know that SuperWeb has released yet another adware app. This time they named it Ski Search, but it has nothing to do with skiing. However, it has everything to do with making a quick buck by nagging unwary web surfers with commercial ads. So, if you are looking for ways to remove this infection, then you have come to the right website, because we have composed a step-by-step guide to manually remove the infection. As mentioned, Ski Search has been developed by the SuperWeb Company credited with releasing numerous infections, such as Coupon Time, Water Plant, Metal Maker, Fruit Basket, and so on. Note that all of these seemingly different infections are actually clones of previously released adware. Ski Search is one of the newest applications to hit the web, though it won’t make much of a difference to Chrome users, as that browser now blocks all SuperWeb infections. However, Internet Explorer and Firefox users aren’t so lucky, since these browsers don’t block this infection. Nevertheless, you can remove Ski Search manually. Ski Search has a website at Skisearch.net, but you can’t get infected with the malware from there, since the download button doesn’t work. The website functions as a promotional tool for the infection, as it provides a description of supposedly useful functions. At any rate, the only way you could have been infected with Ski Search is via freeware bundles. These bundles can only be found on freeware sharing websites such as Brothersoft.com, among others. So, to avoid getting infected with Ski Search, or, for that matter, any other SuperWeb app, always choose custom/advanced installation settings to remove undesirable programs from the installation process. 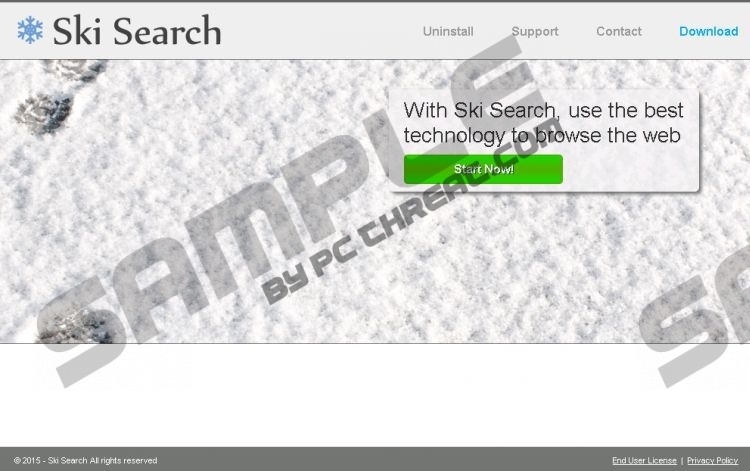 If you get infected with Ski Search, you will be prompted with various coupons, banners, pop-ups, and so on that have been labeled "Ads by Ski Search" or "Provided by Ski Search." The main reason why you should remove the program is simple – it displays commercial third-party advertisements that are unreliable. Indeed, your computer might get infected with malware, as the legitimacy of the ads is not subject to scrutiny by the developers of Ski Search. So, if, for example, your PC gets infected with a Trojan, cyber criminals would be able to remotely control it, record keystrokes in order to acquire banking credentials, and so on. Therefore, it is crucial that you remove Ski Search, because there is no way of knowing what kind of content you would be subjected to. The application is of no use to you, the average user, as it only displays these highly unreliable advertisements that can infect your PC. So, recommend that you remove the infection using our manual removal guide. Find Ski Search and click Uninstall. Quick & tested solution for Ski Search removal.